CLOSED Last Hurrah for March? Re: CLOSED Last Hurrah for March? San's area under the gun with the storms now whew,i wonder if all that is solid rain or..are there breaks inbetween the down pours? OK..the rain has begun here in my area yesssss!! and thunder booming too...well 3-4 hours ahead of what the models were predicting...drive safely folks and watch out for all this lightning ok. I've abandoned the homestead for Carrollwood for the day. Both places are about to catch it, so my fingers are crossed. wow booming thunder, HEAVY rain coming down sideways..thank you, i really needed this. ok JR stay safe..this booming thunder is kinda scary gee. well my birdbath outside is over flowing and rain still coming down here..i bet ive gotten well over an inch and a half already,seminole cty is saying 2 1/2 inches and thats the same storm as i got..man this area really needs this..
for the folks below the skyway bridge..when this storm front gets to Your area..pay Heed to this Dangerous Lightning..mother Nature isnt playing around this time..im watching to see any hail..havent seen any here yet..there is a 10 degree drop in temps once the front gets to you im seeing that on the weather charts. along a line extending from near Pebble Creek to near Brandon. Movement was northeast at 25 mph. Winds in excess of 30 mph are possible with these storms. Mango, New Tampa, Plant City Airport and Tampa Executive Airport. Nearby PWS's are showing a quarter to third of an inch of rain at the homestead. Anywhere from .1 to 1.1 in NW Tampa. guess i'll perk another pot of the blogs Coffee for ya'all. round two about to get to us JR..I can hear the booming getting much closer now.. I just purchased a CoCoRaHS gauge. Too bad I didn’t have it today but I will be ready next time. I see a nasty line approaching Port St Lucie area. Cocorahs reporting 5-6" or rain around Gainesville-Palatka area. Less than an inch here, so far. StPeteFLwx wrote: Cocorahs reporting 5-6" or rain around Gainesville-Palatka area. Less than an inch here, so far. Those are the readings taken this morning from the rainfall that occurred yesterday and overnight. They have continued to get heavy rain there most of the day. There are widespread reports of 6-8 inches in a swatch across the state in North Central FL from Levy county all the way over to the east coast. The highest does appear to be in eastern Alachua and western Putnam counties. Fortunately the area drains really well and there aren't any reports of significant flooding. My oldest was supposed to have soccer tonight on the west side of Gainesville, but it has been cancelled as the field, which drains really well, is underwater. Wellington to near Mission Bay to near Intersection I-75 And U.S.
27. Movement was east at 20 mph. well weatherbug has 100% chance for rain in my area over night, boy gimme every drop you can spare mother-Nature LOL..one thing we dont see around my area most of the day into the nighttime..all this lightning and booming thunder whew..real dangerous outside to walk around...anyone hear of any reported Tornado's? ..........................................this is how the skies looked here up in northern pinellas whew..scarey then came the lightning and booming thunder and heavy rains. Tornado warning about to expire, I'll get the location that it was spotted in the ground. I'm guess roughly 2 miles away. ? Maybe 3? Looks like another line building behind. The WC said 1,000 lightning strikes in less than a half hour. Thanks JR. Whew we sure haven't had weather like this in a long, long time . This must be it bills. Grabbed this from a friend who shared this on a FB page of mine. Crazy day. I know I've had enough excitement, lol. 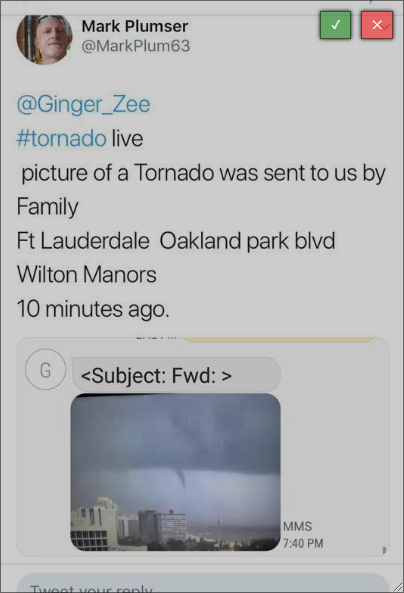 TWC has been showing South Florida live since 3:30. Thanks JR. Right where I live and work. We had nickel size hail. Nothing compared to Aug' s! Didn't know you and Gamma were friends Aug! Her and I go back to 2005! We definitely had one, close by, just can't pinpoint where. I should clarify bills - I read of a tornado from her. Not heard from her personally. Never met her in person but we crossed paths on the interwebs and are FB "friends"
Aug I think pic was phony. They say it was by airport maybe. But at 330-4 they were showing one on ground nearby. No, no gotcha Aug . I figured from WU and FB friends . Same with her and I. Some video's from the area. These are very similar to what I had earlier and are adjacent neighborhoods. PuppyToes wrote: I just purchased a CoCoRaHS gauge. Too bad I didn’t have it today but I will be ready next time. good luck with it PT!! Looks and sounds like there was some ugly weather in all areas yesterday. We had 3 warnings in Pasco county but that's all they were. I had 1.67 in the bucket yesterday and a good thunderstorm early today another.35 in the bucket. I will take that and wait for more hopefully on Sunday. Have a great day all!! Glad everyone is safe!! Good Wednesday morning folks! what a difference a day makes huh! !..well my Last BOOM of thunder and rain was 12:30 am woke me right up was that close wow..well i think we all got a good piece of yesterdays storm huh..yes its been quite a while since ive had rain and so Much Lightning here wow.........well i hope everyone is ok...............blogs Coffee is perked..grab a cup and enjoy...have a great day everyone!! across area waters. Cloud to ground lightning is the primary threat. and a Small Craft Advisory is in effect. Craft Advisory is in effect. Florida waters Saturday night through Monday. lightning is the primary threat. good morning john,yes i'm hoping all made it thru this bad storm ok,i was watching the news last night and they were saying a woman was close to her house and got hit by lightning, i cant remember what town she was in..yesterday was real bad with lightning whew. Nice 50 degree morning here in Levy county. I ended up with just shy of 5 inches for the total event. Not bad for April! I hope everyone got in on the action, but it appears a bit of nasty weather accompanied the rainfall for some. Looks like the rest of the week is going to be just about perfect then another strong front for Sunday. QPF for the next system look less than this system, but still another significant rainfall in the forecast during a time of year we typically don't get much rain. It also looks like a pretty good cool down (at least for mid April) following the frontal passage. I think the last hurrah for march blog topic is over and we need a new one. How bout "April Showers". Alright Largo, get er done. Cool 60 this a.m. here. Ended with .8 yesterday and .4 early this morning. I didn't see as much action as Largo, but I got that inch of rain I was looking for.